The 5 star boutique property in the Vainguinim Valley offers the stay that remains in the mind forever with its stunning locations and the facilities that matches the world's best. The resort offers the proximity of the beautiful Dona Paula beach which is at a walking distance for the resort. The location of the Vainguinim Valley Resort, Goa places it at a distance of 30 kilometers from the airport and close to the various tourist attractions in the Northern and Southern part of Goa. For accommodation the Vainguinim Valley Resort offers beautifully decorated 53 rooms filled with the best of the facilities. The rooms provide a perfect ambience for leisure as well as a business trip. The rooms at the Vainguinim Valley Resort in Goa are categorized as Double and Deluxe rooms which are all air-conditioned. For larger families the hotel provides the facility of inter-connecting rooms. 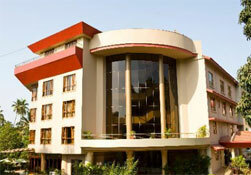 The hotel also provides 9 suites for a luxurious stay amidst the brilliant locales. The restaurants at one of the favored Luxury Hotels in Goa offer the best of food that suite the need for a casual breakfast as well as a grand dinner. The Chances café offers a great ambience with the garden that sits beneath the eatery. The Pan Asian restaurant takes care of the international cuisines while the Gold rush highlights the glamour with the Gaming Resort theme. The bar is the place to sink in the mood and set the tone for a galore. The superb business facilities at the Vainguinim Valley Resort, Goa makes it an ideal place for corporate meetings and conference along with the receptions and other occasions. The well equipped business center offers the facilities of great audio visual support. The 2 halls offer enough space for a huge gathering at the hotel. For recreational activities the Vainguinim Valley Resort, Goa offers the facilities of a state of the art health club along with sauna, steam, Jacuzzis and swimming pool. The Ayurvedic center is the perfect place to rejuvenate your lost senses at the hotel. For entertainment the Vainguinim Valley Resort, Goa has the facility of a casino.